Luisa Chiacchiari first appears in the Painesville, Ohio, area in 1998, about one year before she passed away. In America, Luisa Chiacchiari was known by her married name, Louisa Delfino. Luisa Chiacchiari, daughter of Michele Chiacchiari, was born on December 10, 1886, at Isernia, Italy. She married Donato Delfino about 1912, in Italy. Luisa died on June 29, 1999, at Homestead II Nursing Home, Painesville, Lake County, Ohio, at age 112. Her body was interred at Lake View Cemetery, Cleveland, Cuyahoga County, Ohio. Luisa Chiacchiari, age 26, immigrated to the United States on July 8, 1913, with her son Pasquale Delfino. They were travelling to Cleveland, Ohio, to join Luisa’s husband, Donato Delfino. 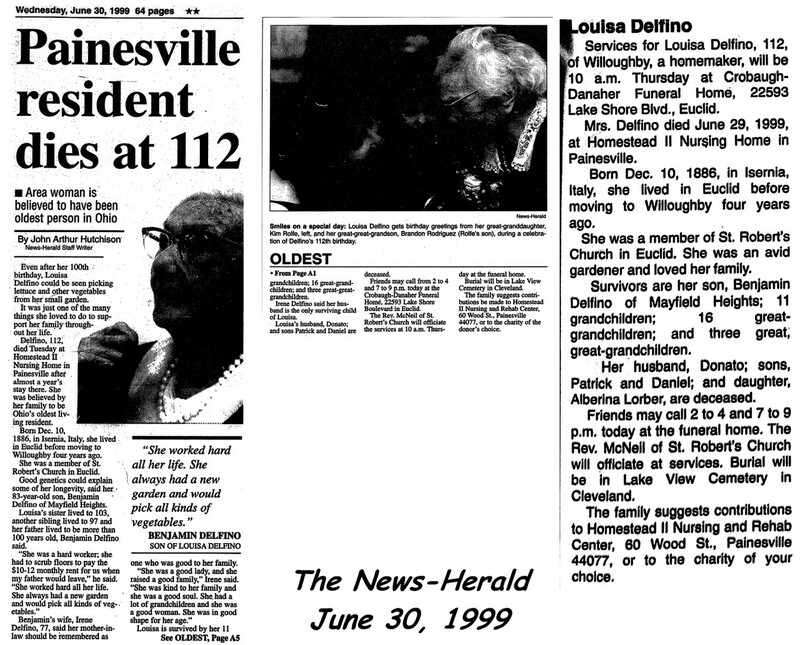 Mrs. Delfino lived in Cleveland, Euclid, and Willoughby before moving to Painesville. At the time of her death, she was the oldest person living in Ohio. As an Italian supercentenarian (people who lived for more than 110 years), Luisa is listed on the website: www.supercentenariditalia.it (in the section “italiani emigrati”). 1. Pasqule Delfino was born about 1912, at Isernia, Italy. 2. Benjamin Delfino was born about 1916 in the United States. 3. Alberina Delfino was born in the United States. 4. Daniel Delfino was born in the United States.